This time of year, we are busy working on landscape architecture projects that are based around swimming pools designs. Summer is for pools and homeowners throughout the tri-state area, as well as many commercials properties, are adding new inground pools to their homes. We have worked on numerous pool designs with clients and we have found that what homeowners often overlook is the landscape design around your pool. 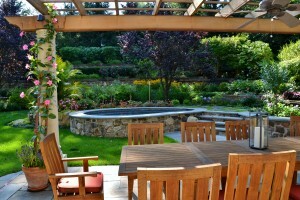 The landscape design process is an important element that needs to follow the pool design phase. Aside from the pool itself, the area that surrounds your new pool addition is another factor to take into consideration during the design process. You are not limited with landscape design around your pool, from naturalistic to tropical, to minimalist to dense; there are endless variations to choose from to finalize the perfect backyard setting to your home. While adding a swimming pool is a large scale landscape architecture project, there are other areas to your propertry that can incorporate other great features and ideas. Such as landscape design and patio spaces, outdoor kitchens, fire pits, garden spaces and outdoor bars. Your pool and your backyard need to be tied together with a complete landscape design. We work on incorporating a patio space, and the appropriate surrounding landscaping. A patio provides a way to blend the outside of your home to the pool, avoiding any damage to your grass. It provides an outdoor area to allow seating, lounging and entertaining. Our skilled designers are also horticulturists that will select the proper plant material that can thrive in sun or shade as well as what will look best to achieve a completed and cohesive look throughout the property. Something as simple as adding planters with seasonal flowers in them helps spruce up your property and is an easy landscape architecture project to include for your home. An outdoor patio is an easy way to create a brand new space to enjoy. Outdoor dining, entertaining, relaxation; a patio creates a new room in your backyard. The addition of a pergola over a patio adds shading and a beautiful fixture where you can hang planters or grow vines. Our team of designers, architects and horticulturists will work with you to create the perfect backyard oasis. Feel free to contact us to learn more about landscape architecture projects and ideas and learn how we can be a great fit for you.